"Deregulation", "banking", "community banks", "small business"
A one-year, $30 billion loan program (through purchase of financial institution common stock and other methods) for community banks and credit unions when they make loans to small businesses. If the treasury makes money from this program (through repayment of the loans), it would go to pay down the debt. $12 billion in additional tax breaks tax cuts to help small business. Republicans are blocking these common sense measures despite the support of traditional Republican allies like the Chamber of Commerce and the National Federation of Independent Business. I think that there is a reason why this isn't considered an urgent measure for the Republicans while supporting tax giveaways for the rich and stopping regulatory reform is. To understand why linking small business and community banks is so crucial, and what is missing from the conservative economic lexicon, we have to take a little stroll into history - the history of banking deregulation, to be precise. So what's the problem - what could be the problem after the nation's largest banks, thanks to much taxpayer help - have not only gotten over the recession but is doing superbly well? The problem is that those banks are not lending. Small and community banks, however, are doing their best to lend in the communities they are invested in. Big banks reduced small business lending by 9% in 2009, while 45% of small community banks actually increased lending to small business over the same period. Small banks today, however, are a much smaller portion of the overall banking industry, and as a result, have a much tougher time lending. Banking deregulation that started in the 1980s and picked up steam in the 1990s, culminating in the repeal of Glass-Steagall in the Graham-Leach-Bliley Act gave large banks free rein to consolidate and tore down the wall between commercial and investment banks and insurance companies. Graham-Leach-Bliley, along with IBBEA (1994) that let big banks open branches in all the states, opened the door that diminished the importance of small, local, community banks. Effects of banking deregulation on community banks and small business. The share of the smallest loans ($100,000 or less - far more often used by small business than big ones) held by smallest lenders (i.e. the smallest banks with assets under $100 million) dropped to 7.1% in 2007 from 25% in 1996. The share of the smallest small business loans (again, $100,000 or less) by medium sized community banks (institutions with assets between $100 million and $500 million) dropped in the same period to 17% from 30%. Large lenders' share of the smallest loans have gone from a mere 18% in 1996 to a whopping 55.6% in 2007 - meaning that while in the mid 1990s, large banks faced competition from community banks and controlled less than a fifth of the smallest loan market, today they command a substantial majority of it. The share of banking industry assets held by the smallest banks - with assets under $100 million - dwindled to 1.5% in 2007 from 7.7% in 1996. In the same time the share of asset s held by medium sized small banks - with assets from $100-$500 million - went from 13.3% to 6.7%. In 1996, loans under $100,000 accounted for 54% of the loans issued by the smallest banks (assets under $100 million). By 2007, the share fell to 29%. For medium sized small banks, the share of smallest loans were forced from 27.6% to 12% in the same period. The bigger banks increased that share from 4.4% to 6.1% in that period. As you can see in the chart below, smaller banks stayed competitive in terms of interest rates for a while (until mid 2002) but resistance to the big banks taking over was ultimately futile. They were forced to raise interest to make up for a diminishing loan volume and market share as well as because -- well, because they didn't have Wall Street's Russian Roulette filling up their quarterlies. The large banks also found a new way to milk the small business borrower for their smaller loans: business credit cards - that they could charge a much higher interest rate on than traditional secured loans. If you thought the percentage of the small loan market controlled by big banks was appalling, wait till you hear this statistic: in 2006, just 12 big financial institutions controlled 85% of the new small business credit card charges. Recall that these big banks also cracked down on credit lines on their credit cards when the downturn hit. In the mean time, while big banks increased their share of small lending, a 6% share is hardly a significant enough portion of their loans for them not to pursue funny money derivative deals on Wall Street. In other words, the small banks with commitments to local communities and businesses have been forced out of the market, and the large banks have little incentive even now to make that commitment. Once the solvency of those gigantic institutions were threatened, of course lending for small business dried up. 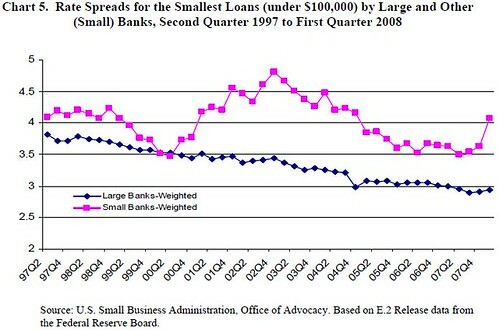 TARP has done little to restore stability to the smaller banks that provide the bulk of small business credit. With Wall Street banks pulling back, some small business borrowers looked to community banks to pick up the slack. Many of these banks, however, continue to struggle with their exposure to commercial real estate loans and other liabilities, constraining their ability to lend. Financial reform passed earlier this month slaps regulations on banks banning proprietary trading and secret derivatives trading, and it forces big banks to hold some stake in mortgages they issue, in addition to assuring borrowers' ability to pay. This might get banks refocused on making money based on sound loans rather than wild goose chases in the market of derivatives and magic money. This, coupled with the small business lending program, might help small community banks and credit unions regain their place as prime lenders in their communities. Well, that can wait, according to Republicans who are still in a love affair with deregulation. Why aren't the Republicans eager to help small business or small banks? Simply put, they believe the system is working exactly the way it should - with multinationals setting the terms and American entrepreneurs suffering.